Watch this movie. Do you have a prejudice based on the subject matter? Get over it and go watch it. Trust me this is the film you should be seeing this weekend. I haven't seen Jupiter Ascending so its not fair for me to make the following statement but I'll make it anyway... Ballet 422 is far and away the best film being released this weekend. 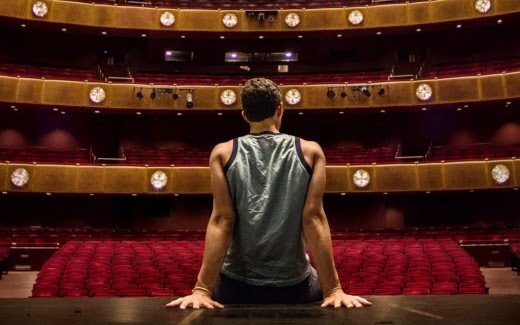 Justin Peck is a young man choreographing his first ballet for the world renowned New York City Ballet. He is working for one of the world's most active and well respected dance companies and we are given full access to his process. I'm fascinated by how things work, especially the things I know nothing about. Director Jody Lee Lipes does a wonderful job in conveying the language of ballet. I'm a layman but I never felt confused by what was happening on screen and at the same time I never felt like the film was holding my hand. That's an incredibly difficult balance to strike and Lipes shows a great deal of respect for his audience by just letting scenes play out. We are never given the reality TV, talking heads cutaways that explain everything we are seeing. Instead we see Peck rehearsing, working with dancers and creating in the moment. The only time the film explains what Peck is thinking is when he's communicating with the cast and crew. This is a process film,we see how a ballet is made, from conception to performance. We are given a behind the scenes look at a young man creating for the first time. Imagine if somebody was making a documentary about Terrence Malick while he was shooting Lanton Mills and you might have an idea of possibilities that lie ahead for Peck.